Captain The Hon. 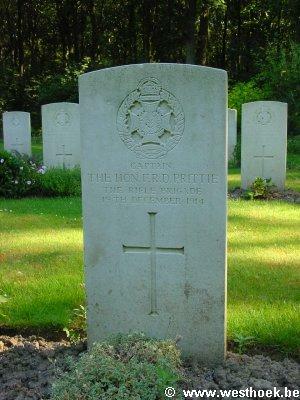 FRANCIS REGINALD DENNIS PRITTIE 1st Bn., Rifle Brigade who died on Saturday 19 December 1914. Age 34. Legion of Honour. Son of 4th Baron Dunalley and Baroness Dunalley, of Kilboy, Nenagh, Co. Tipperary. Assistant Commissioner, Uganda Boundary Commission, 1910-1914. 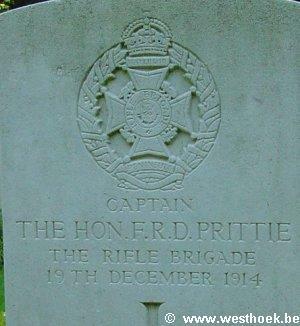 RIFLE HOUSE CEMETERY Comines-Warneton, Hainaut, Belgium Grave IV. F. 5.